Shale gas is mainly methane that is trapped within a clay-rich sedimentary rock at depths greater than 1,500 metres. The low permeability of the rock means that gas, either adsorbed or in a free state in the pores of the rock, is unable to flow easily. To extract shale gas, wells are drilled anywhere from 1500-4000 meters deep, through various layers of rock to access the shale. The wells are lined with cemented steel casings to protect groundwater from contamination. 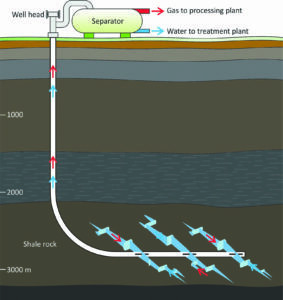 To maximise shale gas recovery and minimise surface impacts a technique called horizontal drilling is used. This technique involves the well changing from a vertical to a horizontal direction deep underground. Before any gas can be extracted hydraulic fracturing, also known as fraccing, needs to occur. This involves perforating along the horizontal portion of the well to gain access to the shale rock. Water containing chemical additives is pumped under high pressure to open up existing fractures and create new ones within the shale rock. This hydraulic fracturing fluid is typically made up of 99% water and proppant and 1% chemical additives. Proppant, such as sand is then added to the hydraulic fracturing fluid, which carries it into the fractures. The proppant holds open the hydraulic fractures after injection stops, allowing the gas to flow to the well and up to the surface. This process is repeated several times within the horizontal portion of the well to create multiple hydraulic fractures. Each injection of hydraulic fracturing fluid is called a stage and requires isolation. 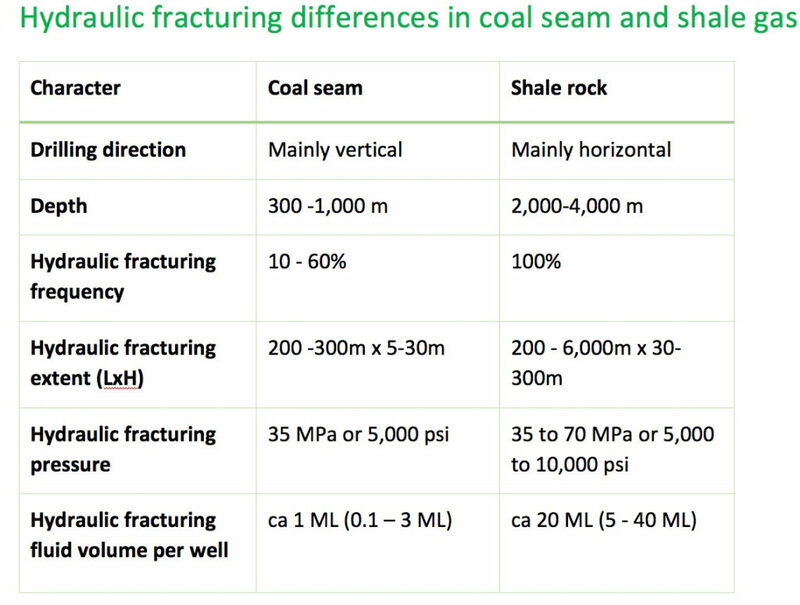 One common method to separate each fracturing stage is with a plug. At the end of the hydraulic fracturing process the plugs are removed and production can start. How much water is used in the hydraulic fracturing process for shale gas? An average of 20 mega litres of water can be used per horizontal well, which would fill about eight average Olympic sized swimming pools. What happens to the extracted gas and produced water? The extracted gas is processed and transported for domestic and/or international use. One of the key differences between shale gas and coal seam gas (CSG) production is that shale gas extraction produces very little water. This is because there is little to no water trapped in shale rocks. If produced water does flow back to the surface then that is mainly composed of hydraulic fracturing fluid. The produced water is usually treated and then either used in future hydraulic fracturing jobs, or disposed of in accordance to state government regulations. A source of concern is the amount of water used in the hydraulic fracturing process during shale gas production. Another concern is that hydraulic fracturing fluids may leave shale rock and enter fresh water aquifers, which are layers of porous permeable rock that allow water to flow through easily. The depth at which shale gas extraction occurs is far below the location of fresh water aquifers, reducing the risk of aquifer connectivity to a very low level. Contamination of groundwater during shale gas production is more likely to occur as a result of surface spills, overflows of containment ponds/tanks or leaks of produced water and hydraulic fracturing fluids at the surface. Other potential environmental impacts include the industry’s greenhouse gas footprint, fragmenting of local habitat and changes to rural communities.